With sustainable investing as much as with investing in general, there is no “one size fits all” approach. Ultimately, it comes down to investors’ goals, from mitigating risks to delivering positive impact, through to seizing sustainability opportunities. To this end, we have developed a comprehensive set of tools and strategies allowing us to prioritize and achieve sustainable investment objectives for the benefit of our clients and society. A preliminary step of the Sustainability Analysis is the screening for controversial business activities and practices. Bank J. Safra Sarasin applies several standard criteria in order to exclude business practices which are in breach of global norms and/or highly controversial business activities. The standard set for controversial business activities screening is embedded in all our sustainable investment strategies. Nuclear Energy Companies that own or operate nuclear power plants (utilities) and companies that supply key nuclear-specific products or services to the nuclear power industry (suppliers). Coal Companies that simultaneously have a significant involvement in the coal business and lack a solid transition strategy towards a low-carbon economy. GMO-Agriculture Companies that simultaneously have a significant involvement in the coal business and lack a solid transition strategy towards a low-carbon economy. GMO-Medecine Human cloning and other manipulations of the human gene line. Defence and Armament Producers of civilian firearms, conventional weapons (systems and critical components) and weapon support systems & services (e.g. weapon control systems, target navigation systems, etc.). Tobacco Producers of tobacco products. Adult Entertainment Producers of adult entertainment materials. Violation of Human Rights Companies involves in severe violations of human rights. This criterion takes into account established international standards and principles (e.g. UN Global Compact). The Sustainability Analysis assesses and compares a company’s ability to manage its ESG risks and opportunities relative to its industry peers. Several ESG key issues are common to all industries: in particular the governance issues such as board structure, remuneration, shareholder ownership & control rights. Other key issues are more important in some industries and/or specific to only a few industries (e.g. carbon footprint or water risk). The methodology takes these differences into account by selecting and weighting key issues by sector on the basis of Bank J. Safra Sarasin’s Industry Analysis. The Sustainability Analysis allows the Bank to produce two scores (company ratings and respective industry ratings) which can be combined and displayed in the Bank’s proprietary Sarasin Sustainability Matrix®. 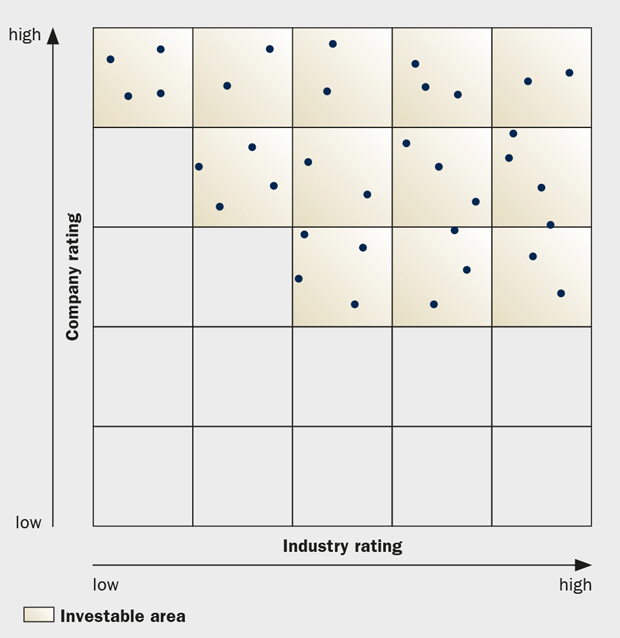 In exposed industries with low sustainability ratings, such as oil and gas or materials, companies must achieve a high company rating to be included in the sustainable investment universe, whereas in less-exposed industries (e.g. telecommunication, IT) companies must only achieve an average company score to be included. The x-axis of the Sarasin Sustainability Matrix® displays the industry rating score between 0 (low) and 5 (high). The y-axis displays the company rating score between 0 (low) and 5 (high). The shaded area contains Bank J. Safra Sarasin’s sustainable investment universe. The white area underneath contains the companies which the Bank excludes from the universe due to insufficient sustainability ratings. The fully integrated sustainable investment approach is not limited to corporations, but also extends to countries: as issuers for sovereign bonds, they collectively account for more than a quarter of all debt issued on international capital markets. Bank J. Safra Sarasin measures the sustainable economic performance of a country based on the availability of natural resources and the efficiency with which these resources are put to use. Here the availability of natural resources provides the foundation for sustained economic growth (illustrated on the horizontal axis in the next figure). 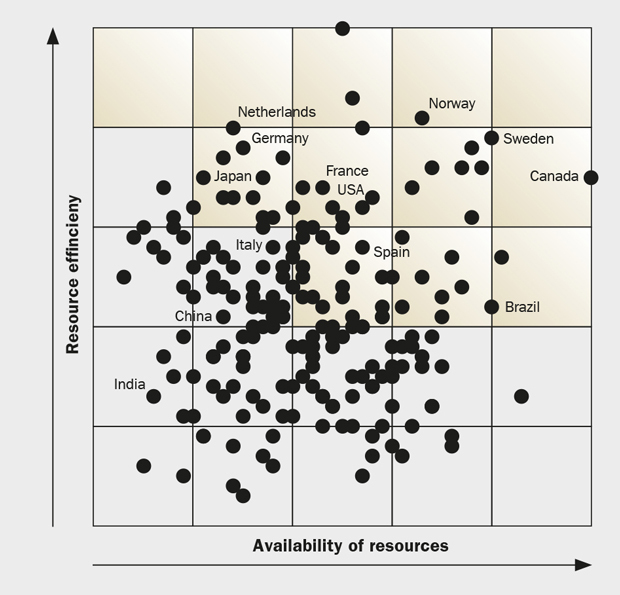 Bank J. Safra Sarasin plots the 198 countries analysed across the two dimensions resource availability and resource efficiency on the Sarasin Sustainability Matrix®. The countries in the shaded area are relatively better positioned and can be invested in, while the countries in the white area are not investable (status November 2017). Bank J. Safra Sarasin’s sustainability rating for countries is based upon 98 data points from publicly available sources, including Amnesty International, United Nations, World Bank, Economist Intelligence Unit, Freedom House, IMF, OECD and the US Central Intelligence Agency. The main benefit of the sustainability rating to the client is the ability to identify structural changes at an early stage. Although the country rating serves as a complimentary tool for credit ratings based on financial criteria, it is not a substitute for them.